The bond between humans and dogs emerged over eons of campfires, hunts, and battles, and today is no different. Dogs still lie around a campfire, enjoy a hunt, and yes, go into battle. 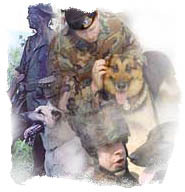 At this very moment military woking dogs (war dogs) are deployed around the world with our fighting forces; places like Iraq and Afghanistan. These highly trained dogs are guarding the sleeping, securing bases and supplies, hunting the enemy, scouting for snipers and booby-traps, finding explosives, sniffing out drugs, and tracking the lost. Day in and day out war dog teams are protecting and saving the lives of Alabama men and women, often with dying loyalty. Their story needs to be told, sacrifices and glory remembered, and their unwavering love and affection never forgotten. So please join us in saluting war dogs and their Alabama handlers by helping to build a memorial, the Alabama War Dogs Memorial Foundation; man’s best friend deserves nothing less. If you would like to share a story or two, send us your story, photos, and signed release agreement to have your story and photos posted on the website. © 2019 AWDM.ORG. All Rights Reserved. Coller Theme by Rohit.